If you've been following my blog for a while then you may have seen my home decor posts such as my Winter Bedroom Inspiration and my Autumn Living Room Inspiration. This time I'm focusing on the room which we spend more time than we think... The bathroom... Now, I'm not suggesting you start ripping out your current bathroom, but with these little additions you could update it from okay to elegant without too much hard work! The two main things on that list which will need fitting are the taps and the mirror. I think both add an edge of contemporary to the style and are very practical. The LED mirror is built with energy efficiency and has 48 bulbs in to help you get photo ready makeup. 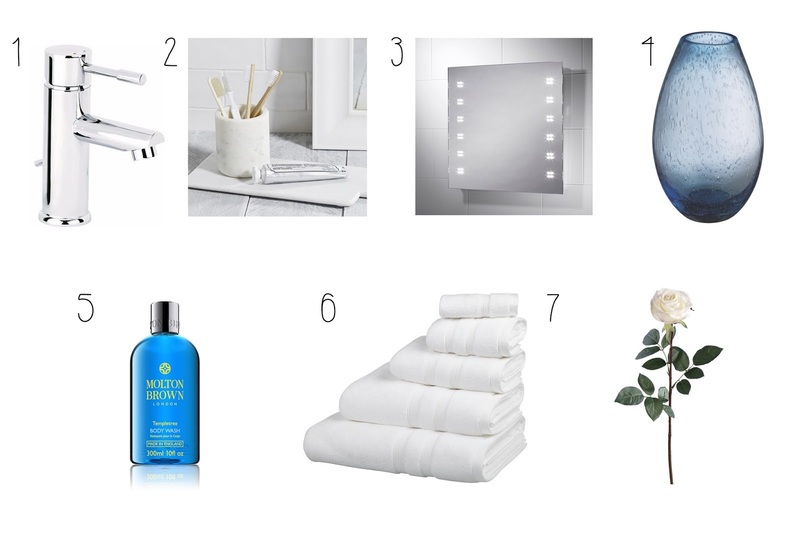 I chose to add a bit of colour with the vase and body wash, and I think blue works really well in a bathroom. Of course you could go for a plain vase and choose a coloured flower instead, but the white rose from John Lewis is great value for money. Other suggestions include an Ikea vase and a John Lewis vase. Let me know if you buy any of these items! View more home improvement blogs! #MNPhotoChallenge December 2016 - Get Involved!